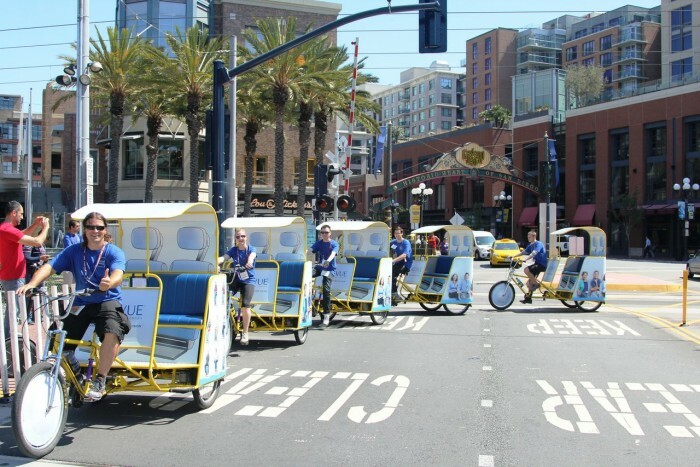 Open Air City Rides With a Message - Pedicabs will circle the convention center and local area hotel transportation corridors; offering rides from the convention center to surrounding event destinations. Each Pedicab will be branded for the corporate supporter for all convention attendees to see. As convention attendees leave the convention center they will see a curbside branded Pedicab Stand, complete with brand ambassador, advertising literature distribution and survey collection capabilities. Drivers act as field ambassadors for your product and hand out pamphlets, coupons, and other collateral that can be stored on the bike. Drivers are smart, fun, and knowledgeable about the city, and can multiply the positive image that your advertisement aims to create. Features Include - rickshaws and riders, rickshaw advertisement wrap, advertiser rider uniform and advertiser literature distribution.